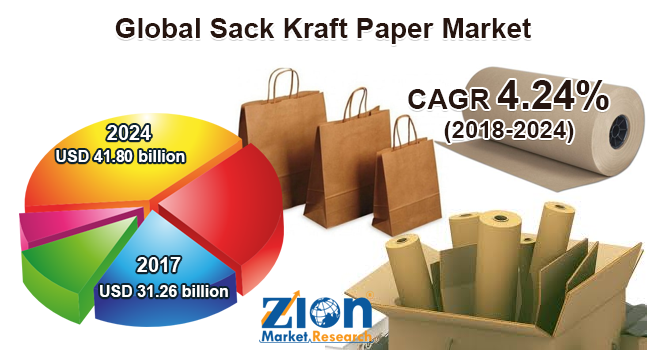 Zion Market Research has published a new report titled “Sack Kraft Paper Market by Grade (White and Brown), by Packaging Type (Open Mouth Sack and Valve Sack), and by End-User (Animal Feed & Pet Food, Cement & Building Materials, Agrochemicals, Food, Chemicals, and Others): Global Industry Perspective, Comprehensive Analysis, and Forecast, 2017—2024’’. According to the report, the global sack kraft paper market was valued at around USD 31.26 billion in 2017 and is expected to reach approximately USD 41.80 billion by 2024, at a CAGR of around 4.24% between 2018 and 2024. Sack kraft paper is largely used for storing materials in powdered forms, such as animal feed, cement, flour, etc. This packaging material is made via the kraft process, using the wood pulp as a raw material. It is a biodegradable product made from eco-friendly materials. This paper has high elasticity levels apart from being highly tear-resistant. Sack kraft papers are widely used in the construction sector. They come in two different grades, i.e., white and brown. The white grade sack kraft papers enhance the aesthetic value of printing and are largely used in varied cement and building materials. According to the Energy and Industrial Strategy, approximately 15,000 tons of cement was used by the construction industry in 2016. The demand for cement is ever-increasing in the construction industry, which is likely to fuel the sack kraft paper market across the globe in the years ahead. The global demand for sack kraft paper has increased around 2% in the last five years. The sack kraft paper market is further expected to register a high rate of growth in the upcoming years. A major restraining factor of the global sack kraft paper market might be the rising deforestation. However, the shifting focus toward the use of greener alternatives is anticipated to offer new growth opportunities to the key players of the sack kraft paper market across the world. The sack kraft paper market by segmenting the market based on grade, packaging type, and end-user. By grade, the market is segmented into white and brown. The packaging type segmented includes open mouth sack and valve sack. The end-user segment includes cement and building materials, chemicals, agrochemicals, animal feed, and pet food, food, and others. The cement and buildings segment is estimated to be the most dominant in the sack kraft paper market globally in the upcoming years. This can be attributed to the increased cement usage in construction activities, thereby accelerating the expansion of sack kraft paper market size in the years ahead. By region, the global sack kraft paper market includes Europe, Asia Pacific, North America, Latin America, and the Middle East and Africa. The Asia Pacific region contributed significantly toward the sack kraft paper market in terms of volume during 2017, owing to the rising GDP and economies of scale witnessed in China, India, etc. The European sack kraft paper market is likely to witness noteworthy growth in the estimated time period. Some key participants of the sack kraft paper market are KapStone Paper and Packaging Corporation, Nordic Paper, Billerud Korsnas AB, Canfor Corporation, Segezha Group, Gascogne Group, Horizon Pulp & Paper Ltd., Natron-Hayat d.o.o, Mondi Group, and Tolko Industries Ltd.